Custom and Cheap IPL Machine 2014 best selling ipl hair removal equipment, alexandrite laser hair removal, beauty equ Supplier and Manufacturer.--Shandong Synthesis Medical Equipment Co., Ltd.
Shandong Synthesis Medical Equipment Co., Ltd. Custom and Cheap Vitiligo treatment machine,Low laser Therapy Device,Photon Therapy Device,Nd:YAG laser machine,Fractional Carbon dioxide laser instrument Supplier and Manufacturer. Packaging Detail: ipl hair removal equipment, alexandrite laser hair removal, beauty equipment is packed in aluminum case. This is the 2013 newest 3-in-1 multifunctional beauty machine. 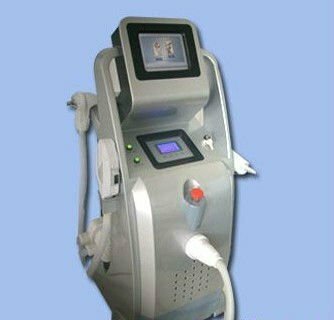 It combined the functionof IPL&RF, Bipolar RF, and ND YAG Q-Switch Laser. You can get so many treatment results with only one machine. This the entire cycling water cooling system makes the stable working of this machine. permanent hair removal; all kinds spots removal; freckle removal; acne therapy; vascular therapy; skin whitening, tightenin, rejuvenation; wrinkle removal; shrinking pores; improving skin elasticity and glossiness; shrink large pores, face lifting, body shaping; all colors tattoo removal, eyebrow line/eye line/ lip line pigments removal.